£100 non-refundable deposit required with booking. £100 bond repayable after inspection following your holiday. Balance payable 4 weeks before holiday starts. 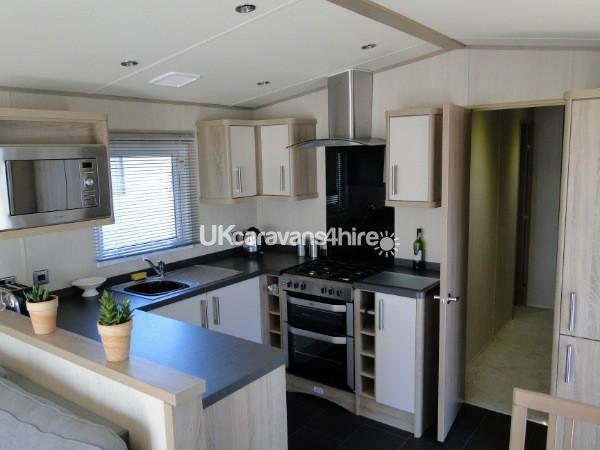 Our privately owned caravan is a ABI Haywood 3 bedroom caravan. 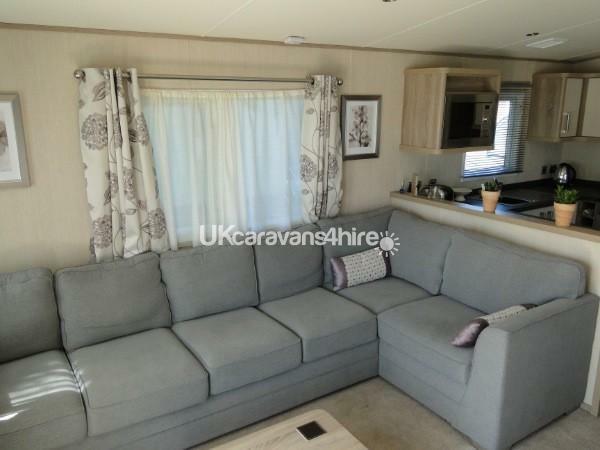 It was brand new in 2014, and is a prestige family caravan. 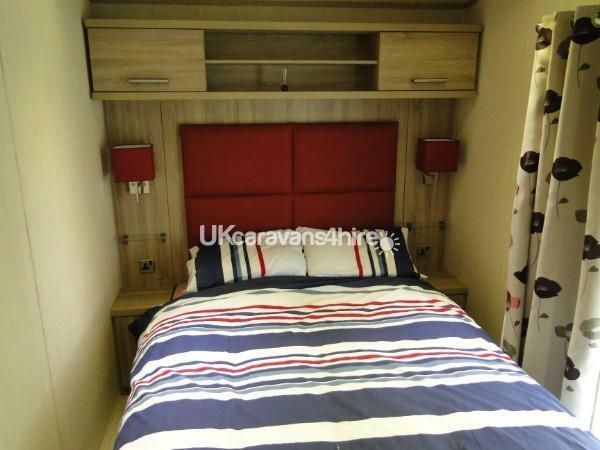 It has gas central heating and double glazing throughout. 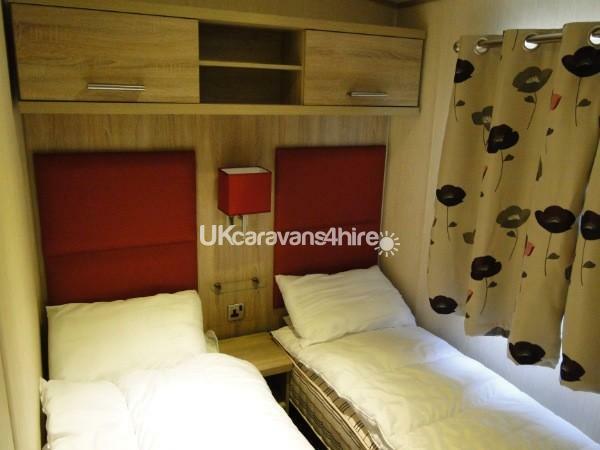 For your safety the caravan is fitted with a fire extinguisher, smoke alarm and carbon monoxide detectors. Featuring an airy open plan living /dinning room and spacious well equipped kitchen. 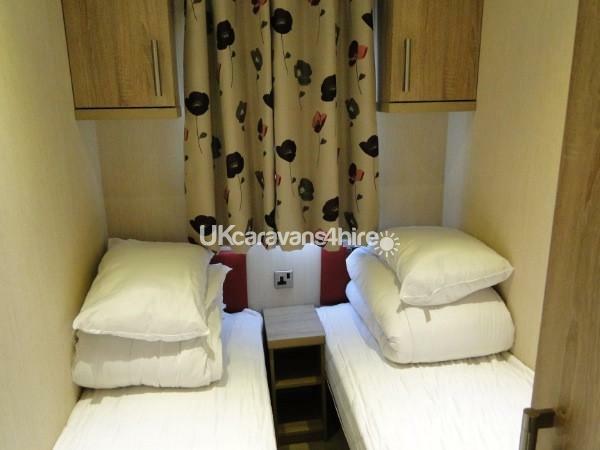 There is 1 double, with dressing table and ensuite toilet, and 2 twin bedrooms (no bunks) There is ample wardrobe space in all the bedrooms. In addition, there is a pull-out bed located in the sofa in the lounge area. 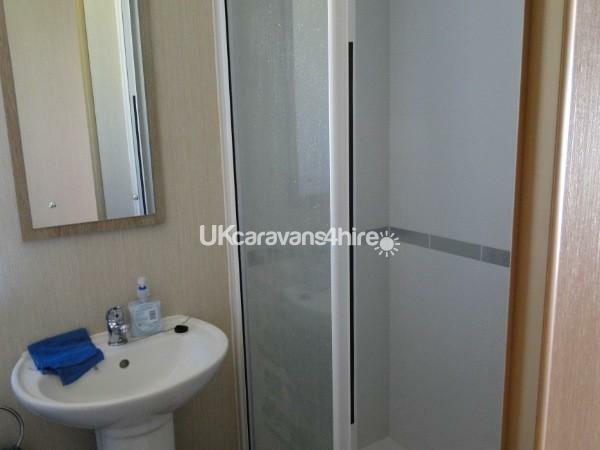 There is a good sized bathroom with a large walk in shower cubicle, wash basin and toilet and plenty.of shelving. The lounge has ample, comfortable L shaped seating, and an electric fire, 32in LCD television with incorporated D.V.D. player. The kitchen has a full size fridge/freezer gas oven grill and hob and adequate glasses dishes and cutlery for everyone, built-in microwave, electric toaster and kettle, with plenty of cupboard storage space. 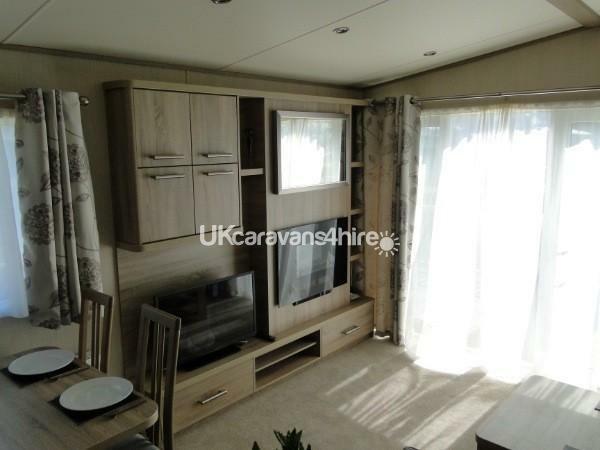 The caravan is carpeted throughout except the kitchen which has a high spec, easy clean floor. There is a large area of decking outside the double French windows, complete with comfortable rattan type seating, and table. 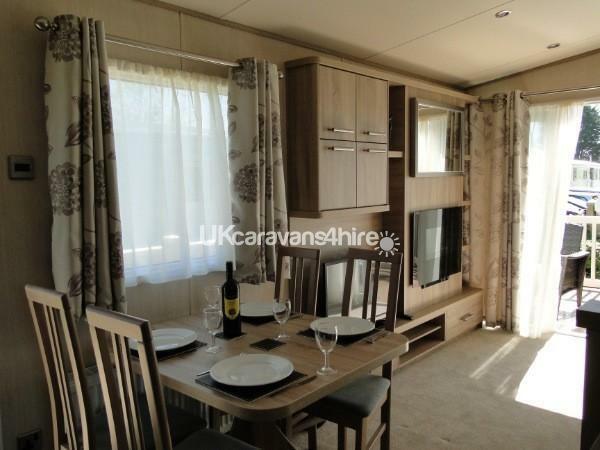 This privately owned caravan comes with mains gas and electricity included. Pillows and duvets are included all you need to do is bring bed linen and towels. 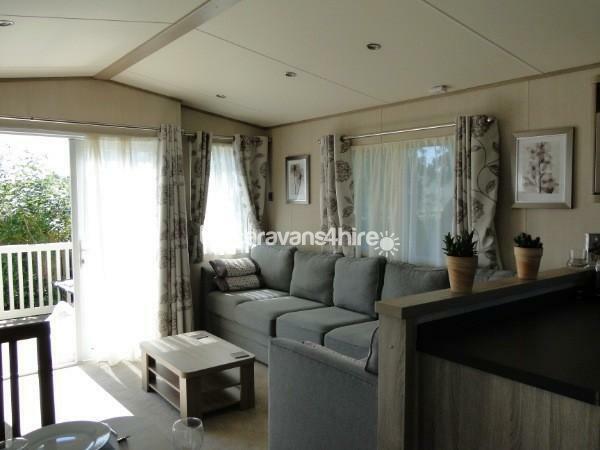 Due to the high standard of this caravan and for everyone`s comfort there is a non smoking policy and no pets allowed . 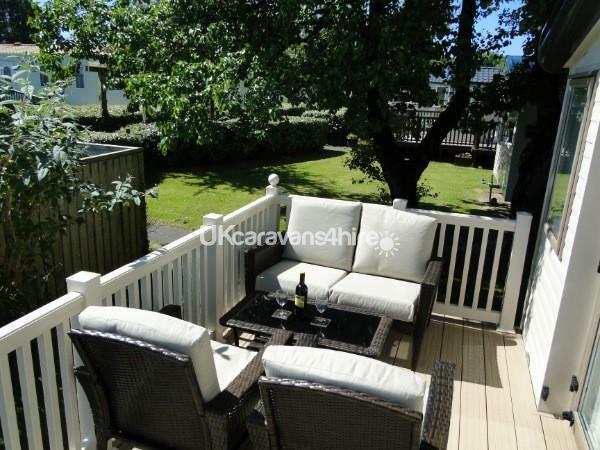 Sited in the Goscar area of the park, it is a short walk from the beach path and shop. Kiln Park Is in a spectacular setting on the Pembrokeshire Coast National Park, right next to Tenby's fantastic South Beach. With everything a family could wish for, Kiln Park promises a fabulous, action packed holiday which includes shooting archery and fencing; Facilities include Bike Hire, indoor splash pool with sauna and solarium, in addition a heated outdoor pool. A huge stretch of sandy beach which is a blue flag is within ten minutes walking distance, with the walled town only a short stroll away with lovely restaurants pubs and shops. Kiln Park is close to family attractions Oakwood theme parks, wildlife parks, Manor House, Dinosaur Park, Heatherton, Folly Farm, Bluestone . Payment by cheque or bank transfer. All late bookings payable by bank transfer. Failure to pay full cost of your holiday by the balance date may result in cancellation of your holiday reservation without refund. Due to the high standard of the caravan and to ensure this standard is maintained there is a security bond of £100 pounds against any damage or breakages to the van this will be refunded after the holiday provided the caravan is left in the same condition as on your arrival.